Do I get to say "I told you so" now? I haven't blogged about it much (if at all?) but I have occasionally ranted on Twitter about the questions, usually in phone calls, that I've been getting for YEARS about the so-called Mayan apocalypse coming on December 21, 2012. I think the first calls started coming around 2006 after one of the many programs that have since been repeated endlessly the on cable channels first aired. I remember in particular a dad who was concerned about his 11 or 12-year-old son who was getting depressed after watching some of these programs. After talking for a while with the dad, I could suss out that there were other family issues (a divorce or separation in particular) and this was probably feeding an already stressful situation. My main recommendation then, after assuring him that the stuff in those programs were mostly nonsense, was to have his son talk with a school counselor. I think I talked with him a couple of times, but I don't know for sure how it all turned out. I got a call from a guy who had watched some wretched History Channel show about how the Mayan calendar was predicting the end of the world in 2012. The man's son (who I think was about 11 years old?) was so freaked out by it that he was having trouble sleeping, wouldn't eat and was generally withdrawing from life over it. I basically told him that it was all stupid mystery-mongering and it was no different from our calendar switching to 2000. He ended up calling back several times and we talked about how to be skeptical about those types of programs. (I also recommended that the son at least talk to a counselor at school since I think there might have been other issues that were at play). He ended up talking to the assistant of one of the authors shown briefly in the program and she told him that the author was very upset at how they had totally taken his work out of context and misreprensented it. I think I had used those exact words when I was describing to my caller some of the tactics that those programs use. I also recommended some books to him and we also talked a little about skeptical thinking in general and I think that I might have made a new skeptic by the time all was said and done. I had forgotten about the rest of that conversation! I've gotten a few random questions over the years, but there has been one guy who has called many times over that stretch. In a way, it was actually a good thing that he kept calling since through him I was able to find out what the latest claims were that were being tied to what I started calling "the kitchen sink" of doomsday conspiracy theories. And boy were there a lot of claims. I sometimes fell down a rabbit hole of stupid by looking up on YouTube the terms or people he was asking about. I haven't heard from him in a while but I *think* I was finally getting through to him, especially after he asked for telescope recommendations! I think that stemmed from the common claim that some bright object in the sky (usually Jupiter or Venus) was the mythical Nibiru/Planet X that was supposed to either hit us or pass close enough to flip us over on December 21. I would tell him that it was either of those planets and he would say "how do you know?" or would edge towards some of the "NASA is hiding stuff" arguments. So I told him, you can look at it yourself and see that it is Jupiter or Venus if you don't believe me. And maybe, just maybe, he did. Then there were a couple of guys who actually came in person to the astronomy department wanting to talk with people, and in those cases, ended up in my office. These were the ones that had the potential to be pretty scary and the thought crossed my mind that I should ask for a panic button in my office (the problem being - I'm a complete klutz and would likely hit the thing accidentally if it was in an easily accessible place when I actually needed it.) One of the guys was, I think, more of an Electric Universe guy (and that's a blog post for another day, but there are other astronomers who have already done some good take-downs on that stuff). But the second one was one of a few people I've talked with who were buying in to the conspiracy talk about "gaps" in the Google Sky maps or things that show up in the IR but not in the visible, etc. Some of those were part of the Nibiru/Planet X stuff, but it was all pretty easily debunked. Unfortunately I completely messed up the answer on what one of those objects was, but since he was actually there in my office, at least I showed him in person the methodology I was using... it just ended up pointing to the wrong answer. But the answer *still* wasn't Nibiru/Planet X! I don't anticipate that I'll hear from any of those people again or that they will call and say "Yep, you were right!". And I know that we'll still be dealing with versions of these claims for many years to come - the Mayan calendar thing was just a convenient date, but most of the claims were around before and will be around after. I've already seen rumblings about a comet that has a chance to be really spectacular next year, similar to the non-story that was Comet Elenin last year. (And I'll note that all of the "see, nothing happened then, did it?" arguments didn't disabuse most people of their 2012 beliefs, so I don't anticipate the non-pocalypse of 2012 will keep people from buying in to future claims.) But if we're lucky, the comet will be another bright Hale-Bopp-like show, but hopefully without a cult suicide this time. I have to admit that the main reason I waited until today to post this was on the outside possibility that a story broke late yesterday of some Jonestown or Heaven's Gate incident, but thankfully it seems none was forthcoming. Whew. So December 21, 2012 turned out to be just another day, like I and many other people said it would be. Solar activity was low, there were the usual number of earthquakes, no supervolcano eruptions, asteroid impacts, etc. I personally used it to catch up on laundry because I've been sick for a week and a half! And before I forget - a BIG thanks to 2012hoax.org for creating the best place for sending people to get good, scientific answers to these claims and giving people a place to air their concerns and be reassured. I know they are planning to re-tool the site into a place that will be useful beyond this 2012 "expiration date" and I'm sure I'll be sending people to the new site too. Since this is getting long, I'll save the "wow, 2012 actually turned out to be a pretty amazing year" stuff for another post! 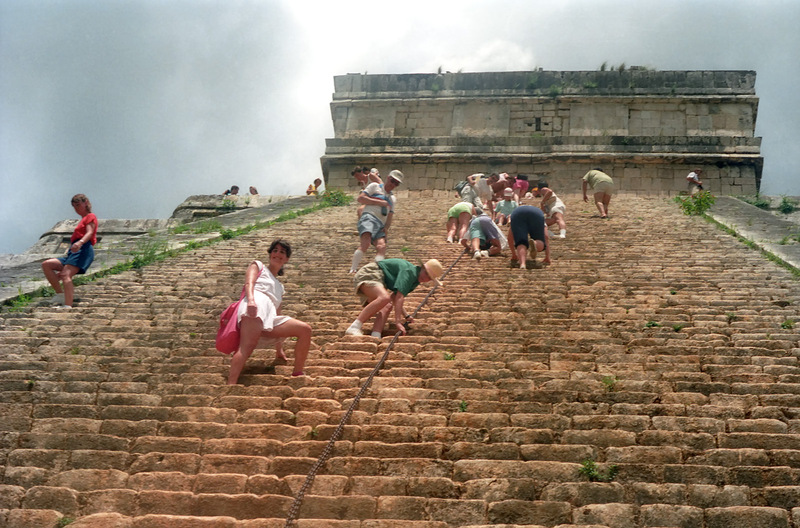 The picture at the top is of the Temple of Kukulkan at Chichen Itza in the Yucatan peninsula of Mexico. Since that was the image that most people seem to include in their 2012 posts, I figured I'd at least pick on with me in it. Yep, that's a 15-year-old me in the green shirt and straw hat in the middle of the photo. I still have that hat! Not pictured: the crutch that I had used to help me get up the pyramid because I had broken my ankle about 6 weeks earlier and was just then getting my muscle back in my leg to walk without support. 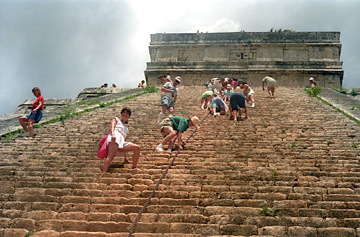 The friend that took the picture carried the crutch back down so I could inch my way down along the chain that runs on the side you can climb to aid people going up and down - those stairs are thin and steep!